” . . . these same secret societies are behind it all,” my father said. Now, Dad had never spoken much about his work. You see, my Daddy was a — spy. He entered into the “intel” world in the late thirties, later, he was OSS and G-2. During the early fifties he was the CIA’s Branch Chief, Head of East Asia Intelligence Analyst Office. I spoke Dutch and Malay before English, whilst my family accompanied my “businessman” father to Indonesia in the early 1950s. That my father had worked for the government was no secret, but it just wasn’t everyday conversation. He then really laid one on me. I really couldn’t relate. The only “secret society” I knew of was the Mafia and my teachers had been stuffing me under desks because the “commies” were going to bomb us. And since it was the sixties—and I was a teenager with my hair growing longer—I just tossed it off as my dad’s way of having an anti-drug chat and went on with life. Many years later I finally had some understanding of what my dad was talking about and—boy—do I wish I had asked some questions. Like, was he was talking about The Order of Skull and Bones? Skull and Bones, the pirates flag, a poison warning—an icon of death—an interesting symbol for what some say is merely a Yale ‘frat’ club. Just some college kids and their bizarre hazing humor—having fun. For almost 170 years that grimacing visage and code of “strict secrecy” has fostered many questions. 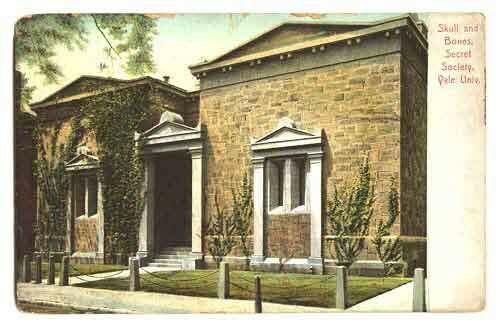 The Order of Skull and Bones is the oldest of several senior secret societies that are unique to Yale University. The “Order” was founded in 1832 by William Huntington Russell and Alphonso Taft. Many historians claim the group appeared as a direct result of the de-secretizing of America’s oldest Greek-letter college secret society, Phi Beta Kappa. Phi Beta Kappa had been “founded with impressive ritual and high solemnity” on Thursday, Dec 5, 1776, at William and Mary College, in Williamsburg, Virginia. 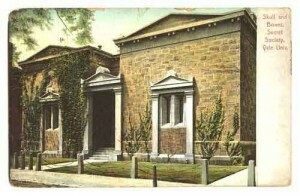 A few years later in April of 1780, at Goshen, Connecticut, four students were “initiated into Phi Beta Kappa.” Later on November 13, the official foundation meeting was held at Yale. “Three weeks and a day later” the chapter at William and Mary came to “an end” due to the threat of a British invasion during the War of Independence. Thus making the group at Yale the oldest existent chapter. New England was going through a transformation from the strict puritanical Calvinist outlooks toward a more secular, scientific worldview. The revolutionary fervor and factionalization of the War of Independence had been sandwiched between a series of religious revivals that swept through the countryside like wildfires. During the first years of our Republic there was a big Illuminati conspiracy scare and a generation later an anti-Masonic hysteria that developed into a political force. The first national party convention—by any party, in the US—was held by the Anti-Mason party, in 1832. Many people, including, John Quincy Adams, who was elected to Congress on an Anti-Mason/Whig ticket, were publicly campaigning against the secrecy of Phi Beta Kappa. From the very beginning Skull and Bones encountered resentment from fellow students. The faculty sent warning letters to the parents of early initiates. Even amid this controversy the chapter persisted and flourished, and by 1884 two other senior secret societies at Yale had been formed: Scroll and Key, and Wolf’s Head. Also, Phi Beta Kappa had been revived after disappearing in 1871. In the cellar, the “File and Claw” raiders found a small room, with an “always-burning lamp” and “a dilapidated human skull.” Upstairs three rooms were found, a lodge room with its walls covered in black velvet, a table with skull and crossbones, and the “sanctum sanctorum,” room number 322, “furnished in red velvet” and on the wall a star with a finger pointing to it. The “Order of File and Claw” also reported “an old engraving representing an open burial vault, in which on a stone slab, rest four human skulls, grouped around a fool’s-cap and bells, an open book, several mathematical instruments, a beggar’s scrip, and a royal crown. On the arched wall above the vault are the explanatory words, in Roman letters, ‘We War Der Thor, Wer Weiser, We Bettler Oder Kaiser?’ and below the vault is engraved, in German characters, the sentence; ‘Ob Arm, Ob Beich, im Tode gleich,”. “Who was the fool, who the wise man, beggar or king? Is Skull and Bones an Illuminati group? Some historians dispute any link between the Bavarian Illuminati and Phi Beta Kappa, and thus Skull and Bones. 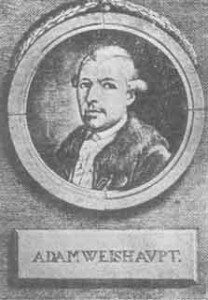 The argument is that Adam Weishaupt didn’t form his group until May of 1776 and that in the ensuing six months there wasn’t enough time for communication and that there was very “little in common between the Bavarian philosopher and the five boys” whom founded Phi Beta Kappa. There had been other secret, semi-secret and open college societies before Phi Beta Kappa, but these had usually had Latin names. The “five boys” who started Phi Beta Kappa were unknown for many years and the main founder was known as just the “young ‘Hellenist.”” Weishaupt—who rebelled against the Jesuit, Roman Catholic, Latin-speaking “power-structure” of his day—had a great fondness of things “Greek.” In the Illuminati he went by Spartacus, the Greek slave who led the revolt against the Romans. All Illuminati members were given “new” names, mostly Greek, similar to Phi Beta Kappa and Skull & Bones members. Every year on a Thursday in May fifteen juniors are ‘tapped”—initiated into next year’s group. There have been a few irregular initiations and member years—usually because of war. Around 2,500 people have been members, mostly white males from old-line inter-related, wealthy New England families. Bundy, Bush, Ford, Goodyear, Harriman, Heinz, Jay, Kellogg, Lord, Lovett, Perkins, Phelps, Pillsbury, Pinchot, Rockefeller, Sloane, Stimson, Taft, Vanderbilt, Weyerhaeuser, and Whitney, are some of the names on the Skull and Bones roster. Minorities were brought in during the 1950’s and female initiates were allowed into the Order in 1991. Members of Order of Skull and Bones have had a great impact upon our society. “They” have friends in very high and—very low places. They occupy key positions in the worlds of commerce, communications , diplomacy, education, espionage, finance, law and politics. Their impact on professional associations and the philanthropical fortune-holding/controlling foundations has been very profound. There have been two Skull and Bones Presidents—with a possible third, George W. Bush(S&B 1968), looming on the horizon; at least ten Senators; two Chief Justices of the Supreme Court and many U.S. representatives and state governors. “Bonesmen” have held a myriad of lesser appointed posts and positions, with a particular affinity for Secretary of War/Defense; diplomatic posts to Europe, Russia, China and the Philippines; and in the national security state/intelligence apparatus. For some understanding of how “they” work let us look at the two U.S. presidents and their friends and families. William Howard Taft(S&B 1878) is the only man who has served as both President and Chief Justice of the United States. His father, Alphonso Taft (S&B co-founder 1833) was appointed Secretary of War by President Ulysses Grant, and later U.S. Attorney General. As Attorney General, Alphonso helped fashion the commission that decided who won the 1876 election. The commission found in favor of Rutherford B. Hayes, a member of Delta Kappa Epsilon, (DKE), originally a junior secret society at Yale, and the only national Greek letter fraternity initially founded at Yale. In 1882, Alphonso was appointed U.S. Minister to Austria-Hungary. He then moved to Russia for two years, leaving in 1886. He died in 1891. His son, William Howard Taft, appointed by President McKinley, to be the first civil governor of the Philippines, displaced a disgruntled General Arthur MacArthur (General Douglas MacArthur’s father) who had been the military governor. Teddy Roosevelt (DKE), who became president after McKinley’s assassination, appointed Taft to serve as Secretary of War (1904-08). While Secretary, he was the “master overseer and troubleshooter” for the Panama Canal; provisional governor of Cuba; and acting Secretary of State, while the Secretary of State John Hay was ill.
William Taft was elected President of the United States in 1909. He had the last cow and the first official automobile at the White House. During his administration, lawmakers sent Constitutional amendments to the states which provided for the direct election of Senators and a Federal Income tax. The foundation for the Federal Reserve System was laid during Taft’s administration and was signed into law furtively by his successor, Woodrow Wilson on Christmas Eve 1913. W. H. Taft was appointed Chief Justice of the Supreme Court by President Harding in 1921, and served until his death in 1930. WH Taft and Family, inluding two future S&B members Robert and Charles. President Taft made Henry L. Stimson (S&B 1888) his Secretary of War (1911-13). Stimson was appointed to high government posts by seven presidents. He was Governor General of the Philippines (1926-1928), Secretary of State under President Herbert Hoover (1929-1933) and Secretary of War under Presidents Franklin Delano Roosevelt and Harry S. Truman (1940-1946). He was “ultimately responsible” for the internment of Japanese-American citizens in WWII and oversaw the Manhattan Project, America’s atomic bomb program. Stimson also took credit for swaying Truman into dropping “the bomb” on Japan. Henry groomed a generation of “cold warriors,” in what was known as “Stimson’s Kindergarten”. Among Stimson’s students were General George C. Marshall, John J. McCloy, Dean Acheson (DKE), three “Bonesmen” from the Bundy family, and Robert A. Lovett (S&B 1918). The fathers of W. Averell Harriman (S&B 1913) and Lovett were both executives for Union Pacific Railroads. Robert and the Harrimans were childhood friends. In 1919, Averell Harriman founded WA Harriman and Company, a merchant investment house, now Brown Brothers, Harriman. Harriman took the reins of Union Pacific in 1932 serving as chairman of the board of untill 1942. Averell had a lifelong interest in Russia, first visiting there in 1899. His last visit at age 91 was in 1983. Averell invested in the USSR soon after the revolution in defiance of federal laws and regulations. The investment firms, Guaranty Trust and Brown Brothers, Harriman—both dominated by “Bonesmen”—were involved in the early financing of Communist Russia. They financed industries, established banks and developed oil and mineral resources. Later, as Minister to Great Britain in charge of Lend-Lease for Britain and Russia, Harriman created a program, that shipped entire factories into Russia and—according to some who were involved in the deal—was responsible for the transfer of nuclear secrets, plutonium and U.S. dollar printing plates to the USSR. Harriman was the US Ambassador to the Soviet Union from 1943 to1946) and was a presidential secret envoy to Soviet leaders Stalin, Krushchev, Brezhnev and Andropov. After World War II, he served as Secretary of Commerce (1946-48), special assistant to President Truman, and the U.S. representative at NATO meetings. Harriman served a term as the Governor of New York (1954-58) and went on to dominate the Democratic national party as its “elder statesman” for the rest of his life. During the Vietnam conflict Harriman served in the State Department as Ambassador at Large for Presidents Kennedy and Johnson. He served as Under Secretary of State for Asia (1961-1963) and Under Secretary of State for Political affairs (1963-65), and led peace negotiations with North Vietnam in 1968. William Bundy went on to be editor of Foreign Affairs, the influential quarterly of the Council on Foreign Relations (CFR). McGeorge became president of the Ford Foundation. Two partners of WA Harriman and Co.’ were Prescott Bush (S&B 1917) and his father-in-law, George Herbert “Bert” Walker. There were many other “Bones” directors and partners, including three from Prescott’s class of 1917. Bert Walker inherited a St. Louis dry-goods import and wholesale business. In 1900, he a started a banking and investment firm named the GH Walker and Company. Walker’s family had developed many international banking contacts and he helped organize the 1904 St. Louis World’s Fair. A wheeler-dealer, Walker was known as the “power behind the throne” in local Democratic politics. In 1919, Prescott Bush moved to St. Louis after accepting a job offer from Wallace E. Simmons (S&B 1890) in his railroad equipment company. That autumn Prescott met Dorothy, Bert Walker’s daughter. That same year, Averell—who needed someone with strong international financial dealings—implored upon Bert to organize The WA Harriman & Co. Averell’s brother, Roland “Bunny” Harriman (S&B 1917), was co-owner. Percy Rockefeller (S&B 1904) was a founding financial sponsor and director. Prescott and his young family went to Connecticut in 1925,where he worked at the Harriman-controlled US Rubber Corp. Then, in 1926, his father-in-law Bert, president of WA Harriman & Company, made Prescott a vice-president. After the firm merged with Brown Brothers and became Brown Brothers, Harriman, Prescott was the managing partner. On October 20 of 1942, ten months after Pearl Harbor, the US government ordered the seizure of “all the capital stock of the Union Banking Corporation, a New York corporation,” by the US Alien Property Custodian. The government order stated “all of which shares are held for the benefit of … members of the Thyssen family, [and] is property of nationals … of a designated enemy country…” Prescott was a director and shareholder in the bank. Averell, Bert and Prescott—using Union Banking, the Hamburg-Amerika Line and other fronts and holding companies—were directly involved in the build-up of Nazi Germany. Corporate lawyer and diplomat, John Foster Dulles, his brother, OSS and CIA spymaster, Allen Dulles, and others helped supply the Third Reich with capital, financial arrangements and asset management services. This whole arrangement was kept very quiet, marked by only a small notice in the NY Times—years later—on Dec 16, 1944: “The Union Banking Corporation, 39 Broadway, New York has received authority to change its principal place of business to 120 Broadway.” No mention was made of the fact that the property had been seized for trading with the enemy, or that 120 Broadway was the Alien Property Custodian’s address. And no ‘fuss’ was made at all, Prescott, later a US Senator, was still a partner in Brown Brothers, Harriman and held directorships for various companies, such as CBS, Dresser Industries, Pan-American Air, Prudential, and U.S. Guaranty and Trust. ” … from a Skull and Bones Society internal history entitled Continuation of the History of Our Order for the Century Celebration, 17 June 1933, by The Little Devil of D’121. After many tries Ned finally met with Jonathan Bush (S&B 1953] brother of then vice-president George Herbert Walker Bush (S&B 1948, DKE) in September 1986. Jonathan told Anderson obliquely “that he would get what he had come after” and said come back tomorrow. Tomorrow never came—the meeting was postponed. “Bones” attorney Endicott Peabody Davison (S&B 1945) of the law firm Winthrop, Stimson, Putnam, and Roberts was called in. After some delay another meeting was held. Davison brought a display case—resembling the one Ned had a photo of—and a skull. The skull was different and appeared to be that of a child. According to a 1988, Washington Post article, lawyer Davison wanted the Apache leader to sign an agreement that disallowed “anyone in association with us to make or permit any publication in connection with this transaction.” Anderson refused. Davison claimed that “the Order’s own history book is a hoax.” However during the negotiations with Anderson, Davison never gave up the stipulation that “Anderson give up his copy of the book.” Ned refused the proffered skull and signed nothing. Prescott Bush won a special election—with Ike’s help—in 1952, and became the senior US Senator from Connecticut. He served on the Armed Services Committee and helped to keep Connecticut’s huge defense contractors busy. Leaving the Senate, in 1962, Prescott rejoined Brown Brothers, Harriman and stayed involved in his family’s business, political and social life. He was very instrumental in his son’s business and political careers. He passed away in 1972, before he saw his son George Herbert Walker Bush elected to be the second US president from the foreign-based secret society, the Order of Skull and Bones. But there was more to Prescott than meets the resume. Prescott Bush had been an operative for Army Intelligence during World War I. He was a liaison to the British and some say he was trained by famous Stewart Menzies, WWII head of the British secret service. Gordon Gray (another one of Prescott’s golfing partners) was the first director of the Psychological Strategy Board, having been installed by the “Harriman security regime” in the early 50’s. Gray and his four elite Jupiter Island, Florida, neighbors Prescott Bush, Robert A. Lovett, C. Douglas Dillion and “Jock” Whitney, are, along the Dulles and Harriman brothers considered by some historians to be the “fathers of this permanent covert action monolith”. The “secret government” in the shadowy realms of intelligence operations that cloaks its actions with cries of national security. “Gray’s son, C. Bowden was President Bush’s very helpful “soulmate'”, “protector of the president, come what may”, White House counsel. He helped to keep George “out of the loop,” as George became embroiled in the evolving Iran-Contra scandal. Eugene Stetson (S&B 1934), an assistant manager for Prescott Bush at Brown Brothers, Harrimans organized the H. Smith Richardson Foundation. The foundation participated in the MK-ULTRA, a CIA domestic covert psychological warfare operation and helped to finance the testing of psychotropic drugs, including LSD, at Bridgewater Hospital in Massachusetts in the 50’s. During the Iran-Contra operations, the H. Smith Richardson Foundation was a “private donors steering committee,” working with the National Security Council to co-ordinate the Office of Public Diplomacy. This was an effort to propagandize the public in favor of and run cover for the Iran-Contra operations, and to coordinate published attacks on opponents of the program. The assault upon the rights of American public through an unconstitutional War on Drugs has just been part of a directed cultural, economic, political and real warfare. There is no true public debate or public exposure. ABC’s Peter Jennings does series of reports on CIA’s shady money dealings—ABC is bought by Bush friend William Casey’s influenced Capitol Cities—and the reports stop. Many a policing agency’s bust is “compromised” by claims of national security; money and property are given back and get-out-of-jail-cards are routinely used—while us hoi polloi’s lives are ruined. Exposes, reporters and agents are summarily squashed, ignored, dismissed, jailed and … killed. A steady drumbeat of events and news stories is used to create fear and division within our society. The targeted racial realities and exploited fears of the drug trade and drug use are used to subdue many and disenfranchise all parts of the community. Along with the crack, came the reality-cop show “popularizing the police state.” More laws, equals more criminals, more prisons, more controls and more corruption. And more money to be made … Prohibition brings higher prices. Competition can be “officially” weeded out and the public pays for anti-drug messages that entreats teens. Drugs are a hard-metal cash crop. “Gold” from the ground—in some places it can be harvested three times a year. Drugs … is the biggest business on the planet.